The Issaquah Robotics Society, nicknamed the IRS, is a robotics team based out of Issaquah High School in Washington State. We are FRC team number 1318 with FIRST, whose mission is to promote science, technology, engineering, and mathematics. The IRS was founded in 2003 and has been building robots ever since. Equipped with motivation, knowledge, and our signature yellow ties, we continue to inspire students and our community. Mentors from real technology companies teach us robotics skills, including mechanical engineering, electrical engineering, business, marketing, competitive strategy, design, 3D modeling, and programming. Our goal is to inspire students to pursue careers in design, engineering, manufacturing, and business, and to spread STEM across our local community. While doing so, we provide opportunities for personal growth, team collaboration, and lifelong friendships. Every January, the rules of the year's robotics game are released. The game changes each year, but it's always a team-based competition with multiple winning strategies. We have six weeks to design, build, and program a full-sized robot from scratch. In the spring, our robot competes against other high schools’ robots during multiple exciting competitions. Awards are given for winning the event, as well as having supiror robot quality, teamwork, business practices, community impact, and sportsmanship. Over the summer and fall, we participate in community events, work on off-season projects, and train new members. A lot goes into building a robot, and even more goes into building a team. To run a successful robotics team, it takes a lot of different people, a lot of different skills, and a lot of teamwork. Mechanics and electricians work on making mechanisms that work well. Programmers ensure that we have control of our robot on the field. Designers use CAD software to plan ahead, and scouters develop successful game strategy. On the operations side, our business subteam works on marketing, fundraising, and organization. We build at least two large robots every year. Some are as tall as we are! They have a huge variety of abilities, such as climbing walls, shooting balls, picking up cubes, throwing discs, and avoiding obstacles. We inspire the local community through outreach programs such as Taking FIRST to the Streets, the ART Project, and FIRST mentoring. 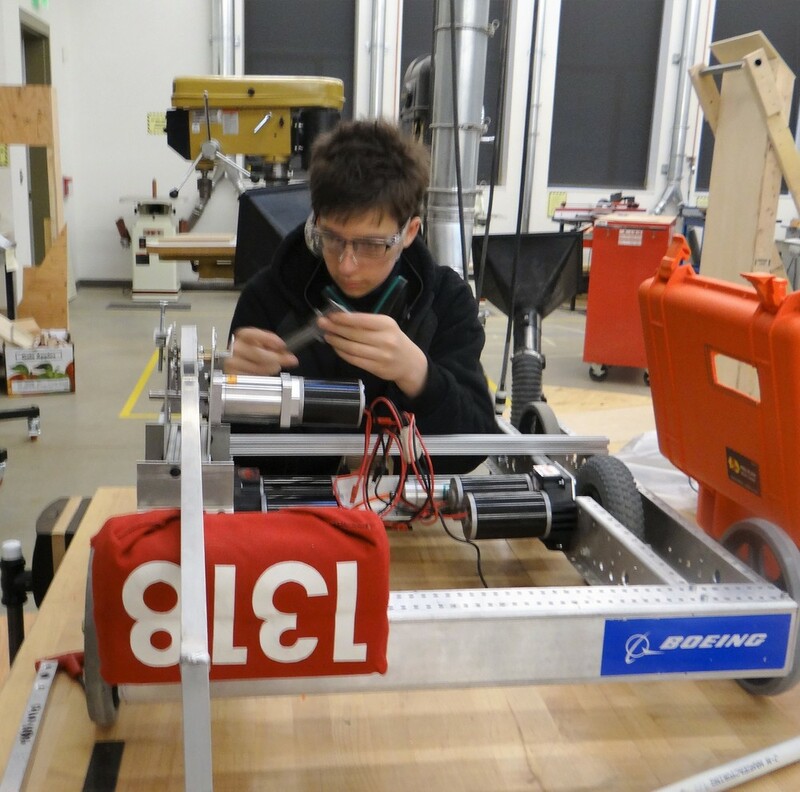 The Issaquah Robotics Society is always up-and-about in the community. Team 1318 is "Taking FIRST to the Streets." We aren't just at science fairs, but also at events where robotics is not usually seen, such as art walks, community festivals, and Salmon Days (which is the largest festival in Washington State). Sometimes we join other FRC teams at these outreach events. The IRS helps and inspires dozens of other robotics teams, whether they work with Lego or sheet metal. Recently, we started the ART Project, aimed at community service,mentoring teams, and event volunteering. We work on these projects using the A.R.T. (Audit, Respond, Teach) method: first we audit the situation by identifying the problem, next we respond to the problem by fixing it, and then we teach our method of solving in order to fix future problems. We accept community requests and have assisted in numerous odd-job projects.